Welcome to the Lareine Engineering blog page. In this blog, we’ll be keeping you up to date with the latest company news as well as looking at industry issues, technology, standards & legislation and other topics related to daylighting & ventilation for buildings in all sectors. Expect a range of posts, from brief comment and updates, to in-depth articles. Look out for regular updates and please let us have your views on any of the topics discussed. 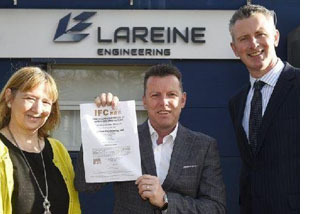 Brilliant news for Lareine Engineering on achieving accreditation under the SDI 19 certification scheme, securing funding and creating new jobs in West Lothian. Lareine Engineering, the rooflighting & ventilation specialist, has gained approval under the new SDI 19 certification scheme, which has been developed by the Smoke Control Association (SCA) in partnership with IFC Certification. Lareine Engineering is opening a new sales & customer support centre in Rugby, Warwickshire, as part of continuing expansion plans. 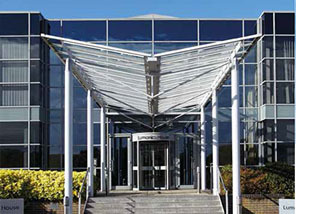 The company has seen significant growth over the recent years, following the successful integration of a range of new products and services to its portfolio. The Grenfell fire tragedy and subsequently the Dame Judith Hackitt report have focused attention and scrutiny on fire safety systems. In particular, issues have been raised around the culture of the construction industry and the need for a more rigorous regime to ensure correct certification of fire safety products and the professional competence of the contractors who install them. Daylight. Done Right: the new RIBA accredited CPD seminar from Lareine Engineering. 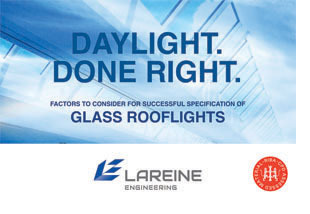 Lareine Engineering, the leading UK supplier of rooflighting and ventilation solutions, has prepared a new CPD seminar giving detailed information on the specification of glass rooflights. The Smoke Control Association, of which Lareine Engineering is an active member, is now providing useful updates on Twitter and Linked in, so interested parties can stay up-to-date with its current initiatives. 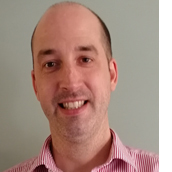 Lareine Engineering has announced the appointment of David Brown as Senior Business Development Manager, to support and drive further growth in the Company’s Ventilation Division. Ian Doncaster represented the Smoke Control Association (SCA) of which Lareine Engineering is a member, at a recent roundtable meeting discussing key issues around smoke control regulation after Grenfell. 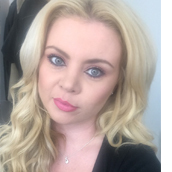 Lareine Engineering, the leading UK supplier of rooflighting, smoke and natural ventilation solutions, has expanded its nationwide sales team with the appointment of Maria Carthy as Sales Specialist covering the North East of England and North Wales. Lareine Engineering has published a detailed case study covering the installation of over 600 Brakel Ventilators at Meadowhall Shopping Centre in Sheffield. 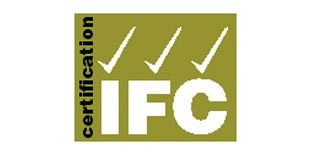 A new certification scheme developed by the Smoke Control Association - of which Lareine Engineering is an active member, in partnership with IFC Certification, has been finalised and is expected to help raise standards across the industry. Following the acquisition by Kingspan of European ventilation specialist Brakel, a new suite of data sheets has been produced, covering Brakel's comprehensive range of ventilation and ancillary products. View or download here. The Directors of Lareine Engineering are delighted to announce the Company’s new position as a Kingspan Light + Air strategic partner. This follows the acquisition by Kingspan of European ventilation specialist Brakel, with whom Lareine Engineering has worked as a Certified Partner since 2016. The Smoke Control Association (SCA) has broadly welcomed the recommendations in Dame Judith Hackitt’s final report, ‘Building a safer future – Independent Review of Building Regulations and Fire Safety’. The Smoke Control Association (SCA), of which Lareine Engineering is a member, has submitted proposals to improve smoke control guidelines within Approved Document B of the Building Regulations. Lareine Engineering has recently successfully undergone assessment by Constructionline, to raise its membership status from Silver to Gold. Lareine Engineering has just completed the installation of a new smoke ventilation system at a large shopping centre in Sheffield. Following recent events, there has been a lot of discussion and debate in the media about the relative merits of ‘active’ systems such as sprinklers and ‘passive’ systems such as fire rated glass and smoke containment systems for protection against fire spread in buildings. The Chair of an independent review into building regulations and fire safety has found that a “universal shift in culture” is required to rebuild trust amongst residents of high-rise buildings and significantly improve the way that fire safety is assured. Workplace (Health, Safety and Welfare) Regulations state that: “every workplace shall have suitable and sufficient lighting which shall, so far as is reasonably practicable, be by natural light”. Lareine Engineering Director David Mowatt, Chairman of the Smoke Control Association (SCA), has issued an open letter to the Building Regulations and Fire Safety Review, raising the point that smoke ventilation must be represented on the review of the building regulations following the Grenfell fire. Lareine Engineering is among the first companies in the sector to adopt a formal policy to ensure that there is no slavery or human trafficking in its own business or within its supply chain. Lareine Engineereing has joined the BIBA CPD Providers Network and is now offering a RIBA Accredited CPD Seminar entitled Smoke: Tackling the deadly enemy. It’s widely accepted and generally understood these days that sunlight plays a vital role in human health and wellbeing. But going beyond the generalisations and looking at some of the actual data published by academics and respected experts across the world, there are some amazing facts coming to light. Here are seven, to get you started. Lareine Engineering is now able to offer the Innivate range of high performance Louvre Ventilators, to complement its existing range of System 75 Louvre Ventilators. A common error when designing a Performance Louvre system, is the use of Free Area as the metric from which the required louvre area is calculated. This method can lead to an overestimation of the required louvre area or worse: an under-estimation of the area required. Lareine Engineering Director, David Mowatt, has recently been elected Chairman of The Smoke Control Association - SCA. 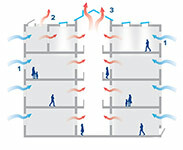 David Mowatt, Director of Lareine Engineering, discusses the dual roles of daylighting & ventilation in creating healthy and safe internal environments. This article was recently published in DAYLIGHTING Magazine.